I have been MIA for a few weeks now, enjoying the summer visits of Gep and Kat. Gep has returned home, Kat is a late sleeper, and so I am taking advantage of the quiet time to play with Cee once again. If you had to have your vision corrected would you rather: glasses or contacts? Or what do you use if you need to have your vision corrected? I do have corrected vision – in my younger days I tried contacts because glasses annoyed me but my astigmatism makes it difficult to be fitted with contacts that work well. I did wear them for awhile but could not drive at night with them in, and since my work then required many long days it became problematic. I have since conceded the battle, and wear glasses now – but only when I want to see my world clearly. Like all waking hours of the day. Are you more of a dog person or a cat person? I’m really an animal person, as so many of you have said about yourselves. Dogs are more loyal than cats, I think – certainly more needy than cats. I have two dogs now, my old girl Bailey who has really bad arthritic joints and has already lived longer than is average for her size dog, and younger Shasta, who is a love and requires lots of attention. But also sheds constantly, being a white lab. When my dogs are no longer with me, assuming I outlive them, I will adopt an older cat from the shelter. If you were to buy a new house/apartment what is the top three items on your wish list? I’m going to take the liberty of assuming cost is of no consequence with this question. My first wish list item would be that it be oceanfront, and have a large deck/balcony/patio that offers a clear view of the beach with the ocean waves slurping up onto the beach. I want the view and the sound. My second item would be a fireplace for cool nights and days – whatever kind would work best and require the least work. My third item would be sufficient room for kids and friends to come and stay with me, as well as a small private green space. What inspired you this past week? Feel free to use a quote, a photo, a story, or even a combination. Not quite sure if my answer truly fits into the “inspired” category, or if it should be a “led astray” category. My Kat, as is her custom, supplies her wardrobe by making online purchases that are shipped to my house every summer. This year, those supplies included a couple of pair of leggings that were a bit too small for her, but fit me perfectly – “inspiring” me to supplement my wardrobe with new tunic tops. More than one. Or two. Online shopping is maybe a bit too easy and convenient. But the good news is it’ll get me out of jeans and sweatshirt rut this fall and winter. That is good news, right? 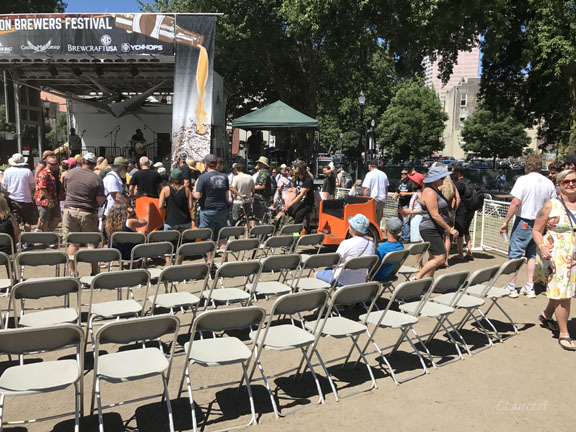 Now, some photos from what has become an annual tradition with Gep and Kat – attending the Oregon Beer Fest in Portland the last weekend of July. This year we were joined by my dear friend and the kids’ adopted “aunt”. Carol — “When my dogs are no longer with me, assuming I outlive them, I will adopt an older cat from the shelter.” yes, Yes, YES! I’ve never heard of mono vision via contacts before, only via lasik. Cool!! I like your house. I think you’ve got an excellent chance of finding this hypothetical home, if money is no problem. I tried the leggings and tunic route, but ended up back in the jeans and tee shirt world. Leggings didn’t keep my knees warm enough! We’ll see how the leggings do in the winter. 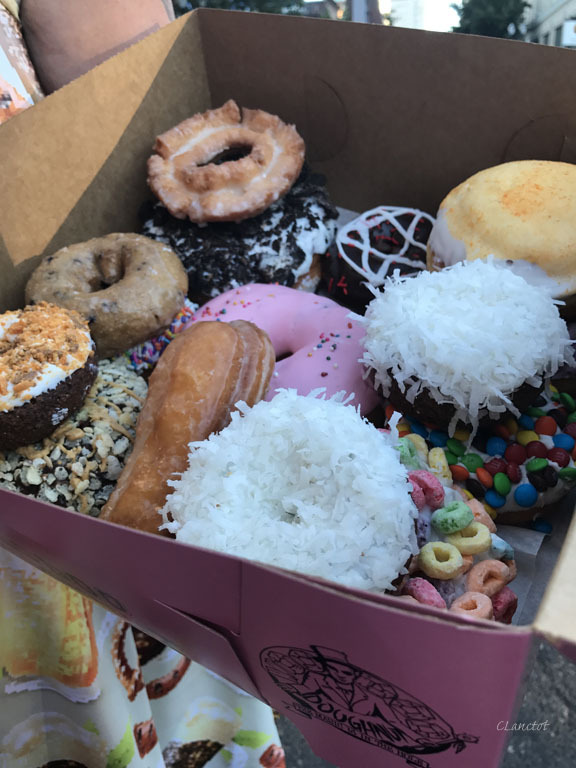 I have heard so much about Voodoo Donuts. Is there always a line out the door? Our claim to fame here in the south is Krispy Kreme. Which I can count on one hand the number of times I have visited. 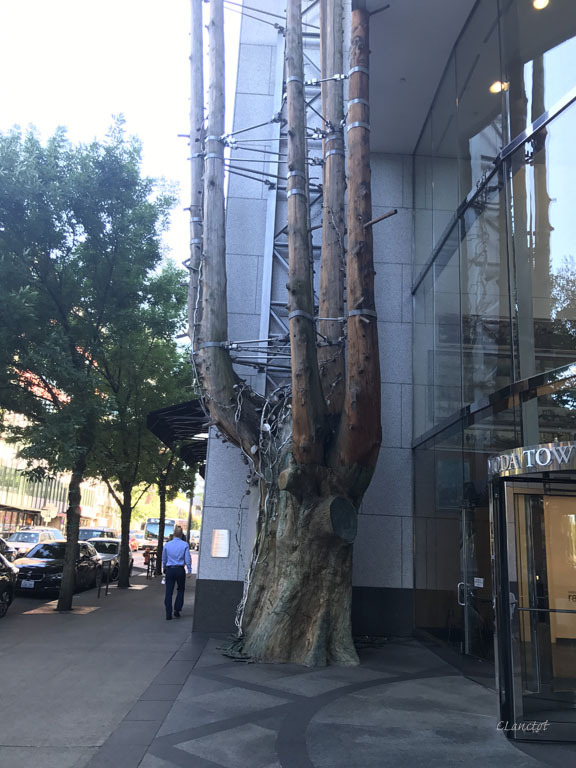 Silly question: Is that tree real on the Portland Street Scene photo? It sure is a huge one. I haven’t ever seen Voodoo without a line, but t it is open 24 hours, so maybe at 1:00 a.m. I think the tree was real, but it didn’t grow in that spot. LOL.. I have a pic from the Voodoo Donuts at Universal City walk because the line was soooo long (50 people?). I know Lasik can correct most astigmatism but at our age, I think the “go-to” is “pre-cataract” lens replacement, which should correct most vision problems.. since it’s an whole new, fake, lens and astigmatism should not longer be possible. But I should probably look into that since I have astig in one of my eyes. Beachfront house with fireplace… I remember walking in the Naples area of Long Beach in fall and a home had the most gooooorgesous indoor/outdoor glass fireplace (in an exterior wall, so it heated both the patio and the living room) and I was soooo insanely envious!! You’re in Portland? I wonder why I didn’t realize that. I might take a trip up there this… fall?? 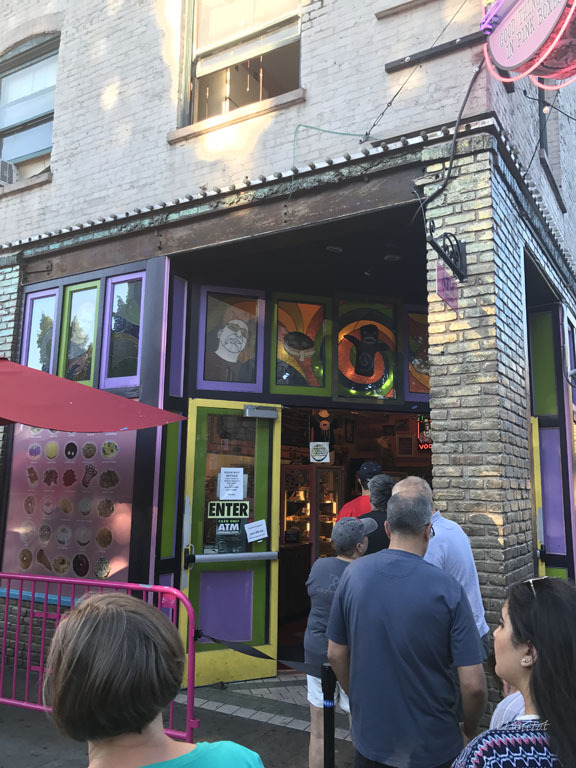 I think the line at Voodoo when we stopped was the shortest I’d ever seen it. We went to Portland for the Oregon Beer Fest. I live nearly 5 hours southeast. I laugh about Voodoo lines because I don’t like donuts. I’m sure they’re good.. and I’d prob like one if I tried it but…. nope.